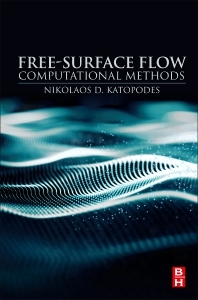 Free-Surface Flow: Computational Methods presents a detailed analysis of numerical schemes for shallow-water waves. It includes practical applications for the numerical simulation of flow and transport in rivers and estuaries, the dam-break problem and overland flow. Closure models for turbulence, such as Reynolds-Averaged Navier-Stokes and Large Eddy Simulation are presented, coupling the aforementioned surface tracking techniques with environmental fluid dynamics. While many computer programs can solve the partial differential equations describing the dynamics of fluids, many are not capable of including free surfaces in their simulations. Nikolaos D. Katopodes, University Michigan Ann Arbor, Department of Civil & Environmental Engineering, Ann Arbor, United States. Dr. Katopodes has chaired or co-chaired 28 PhD student theses. His research has resulted in over 200 publications, and several software packages that are used worldwide for the analysis and control of free-surface flows.